It's summertime once again here in the Philippines and the premier comic event of the season is just around the corner! On May 26, 2012, all roads of fantasy, adventure, humor, and superheroic excitement lead to the Bayanihan Center in Pasig City! Here comes Summer Komikon 2012! Once again, Callous Comics will be at the independent comics area, known in Komikon events as the Indie Komiks Tiangge (see the other indie comic creators in the area)! Here's what's in store for you from the Callous Comics tabletop! The webcomic doctor is in! 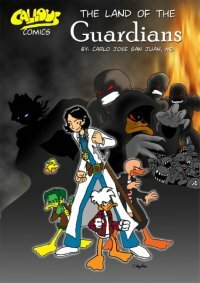 Dr. Rianne Nicah is a struggling new physician who braves the world with her Guardian Duck, Cal Duck! Meet Rianne and her friends in the first-ever Callous Comics compilation! Book is A5 size (5.23"x8.27"), saddle-stitched, with 32 full-color pages. Features Black & White and Colored comic strips. The webcomic doctor returns! 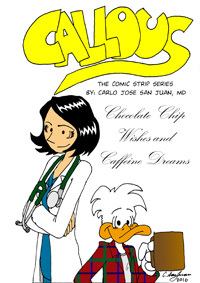 Dr. Rianne Nicah, Cal Duck, and the rest of the Callous Comics gang return in their second comic strip compilation! Book is A5 size (5.23"x8.27"), saddle-stitched, with 36 full-color pages. 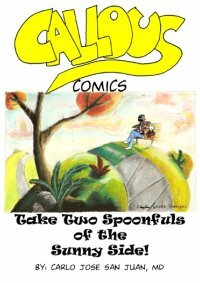 Features full-color comic strips and Sunday comics! An ancient evil threatens the world of the Guardian Ducks and Dr. Rianne Nicah is made to brave their world! Could she be the key to stopping this menace? Book is A5 size (5.23"x8.27"), saddle-stitched, with 32 full-color pages. Features "The Land of the Guardians" and two bonus storylines. This year's new release has Rianne and Cal Duck returning to the land of the Guardians! A shadowy threat is plaguing the inter-realms! Will they be able to stop it? Book is A5 size (5.23"x8.27"), saddle-stitched, with 52 full-color glossy pages. 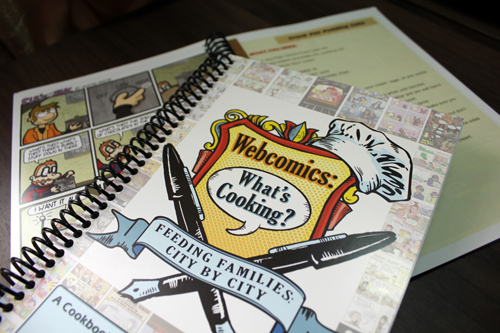 Callous Comics is a proud contributor to the Webcomics: What's Cooking? project, a campaign to help raise money to benefit food banks across North America! The book features full-page, custom-created comics and/or artwork by over sixty great webcomic creators from around the world, paired with a fun, tasty recipe! Satisfy your hunger, tickle your funny bone, and help those in need at the same time! Read more about the cookbook HERE. Those who do purchase the cookbook will receive a limited-edition Captain TGT magnet featuring artwork by Lar deSouza for FREE! That's a combined value of USD $21.95! Also, I'll put in a free sketch into the book's sketch page to start off your collection. The Callous Comics figurines by Rommel "Omeng" Estanislao will also be on display. Have your picture taken with the Cal Duck and Ling Duck plush dolls! They also offer free hugs (just don't get them dirty).